Is yoga for men? I sometimes come across those who think yoga is more a domain of lycra-clad bendy ladies. Their notion of yoga is a “girlie workout” — and we cannot blame them, as the media’s image of a yoga practitioner is often a lithe woman sitting in a lotus pose with a serene expression — surely she is a vegan too and does detox every month! Men also fear the would be severely out of place in a yoga class full of women, so decide to stick to their tried and tested fitness routine — that is, if they have one. But they are missing out! If you are one of those men who think that people who practise yoga are not willing to do a proper “tough” exercise like running or weight-lifting, think again. Yoga was originally developed in India as a rigorous discipline by men, and for men, to strengthen and cleanse their bodies. The truth is, you can make yoga as hard as you want. Top yoga practitioners are accomplished athletes whose level of fitness is second to none; they are lean, strong, very supple, mentally sharp and often live to a very old age in great health. Men usually seek to improve their fitness through competitive sports, or in the gym, working – and often overworking – isolated muscle groups. The trouble with this approach is that all of these are performance oriented: how far can I kick this ball? How can I beat my opponent? How much weight can I bench press today? Often, not much thought is given to how the activity impacts the overall mechanics of the body. What we see then are footballers with destroyed knees, golfers with chronic lower back pain and lop-sided squash and tennis players. Men are also biologically more prone to becoming stiff and rigid than women. Now, lack of flexibility is not necessarily a bad thing — men usually have more stable joints and suffer less from connective tissue disorders than women. I always say it’s better to be stiff than to be overly flexible. Problems arise when repeated wrong movement patterns pull our bodies into the wrong shape. Men have more bulky muscles which, if over-built and not stretched properly, become tough and unyielding and can cause a range of musculo-skeletal issues. In a good yoga class, one works mindfully and purposely to make the body balanced, powerful, supple and pain-free. A carefully guided yoga class aims to build strength and work intensely on core stability, balance, agility and functional flexibility, restoring full range of movement in all major joints. Men who have never done any yoga are often very surprised how hard my classes are for them. Muscles that have been dormant suddenly have to work overtime! As I have mentioned, the great thing about yoga is that you can make it as challenging as you wish. The possibilities are endless. If I see you are strong, I will ask you to go for the tougher stuff — chaturranga — down-dog transition, chatturanga into plank, side-planks with leg lifts, forearm planks, lifting into crow from a headstand etc. It is very unlikely you will not feel challenged by these. You might even sweat out a little puddle, too! So don’t forget a towel. But it should all be good fun — and, above all, safe. You are invited to go inwards. You are not chasing a ball or riding a wave. Just seeing where your body can take you on your mat. If you’d like to see a truly superb yoga practice, have a look at Cameron Shayne in this video. 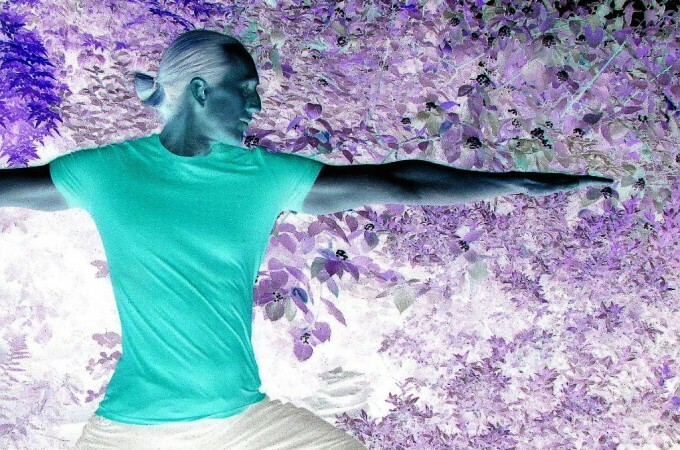 He is the founder of Budokon, a blend of yoga and martial arts. I have met him a few times at the London Yoga Show, and and he is truly an inspiration. And if you want to come and join the brave men in my classes, check out our timetable. If you are completely new to yoga, sign up for Yoga Basics from 6-7pm, a six-week course designed to teach you all main asanas (poses) and develop greater understanding of your body. After completion, or if you have done yoga in the past, you can continue to improve in Vinyasa Flow Yoga, a dynamic class where poses are linked together into a continuous flow. There is no end to how hard you can work, and how much you can learn.